In 2012, the Diversity and Inclusion Sports Consortium was established as a partnership among diversity and inclusion practitioners from the largest sports organizations in the United States. Members of the consortium engage in meaningful, thought-provoking and open dialogue; work together to exchange best practices for diversity and inclusion efforts in the sports industry; and produce ample resources and best practices to advance diversity and inclusion within sport. Consortium members include: ESPN, Major League Baseball, Minor League Baseball, Major League Soccer, NASCAR, the National Basketball Association, the Women’s National Basketball Association, National Football League, National Hockey League, PGA of America, the PGA Tour, the United States Olympic Committee, the Ross Initiative in Sports for Equality, the United States Tennis Association and You Can Play. 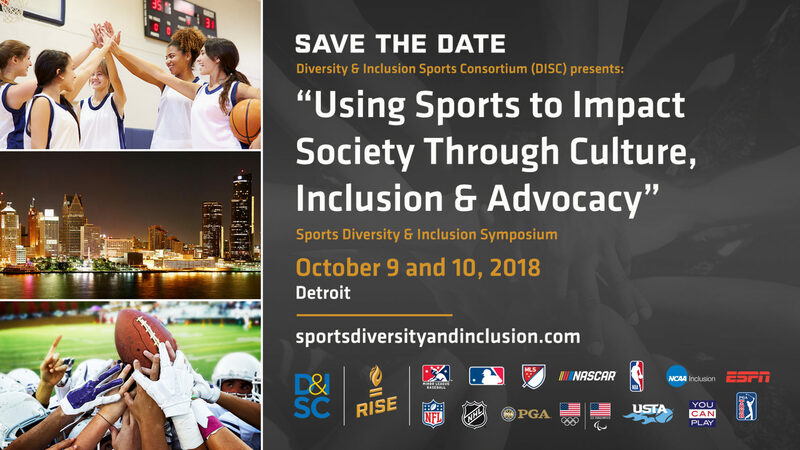 Each year, a member serves as host for the Sports Diversity and Inclusion Symposium, a forum to discuss, evaluate and create tangible solutions that drive greater diversity and inclusion in today’s sports culture. Designed to recognize, celebrate and encourage diversification in the world of sports, the forums feature influential and prominent leaders from Olympic, Paralympic, professional and amateur organizations in expert panels, roundtable discussions and general sessions.